This fall, expect an onslaught of returns from major music acts--especially those on the teen scene. With 98 Degrees releasing their latest last week, the barrage started. 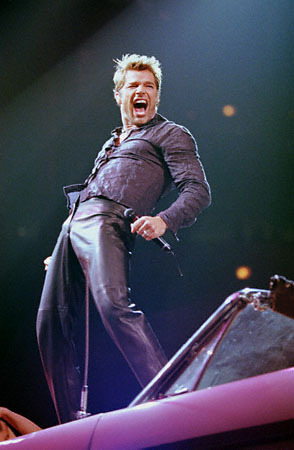 Timed almost perfectly with that are new tracks from Ricky Martin--who started the Latin movement discussed last week--and The Spice Girls. In each case, the result has been less than impressive. airwaves. The first of the batch to top the charts--on the Mariah Carey/Joe collaboration "Thank God I Found You"--98 Degrees has always been among the more soulful of the flock. No more, however. Their current single, "Give Me Just One Night (Una Noche)" has taken them beyond the "'N Sync-wannabes" label and placed them in all new, and even less desirable, territory. They are now visibly milking the Latin music craze like no other. Featuring only two Spanish words throughout--the title "Una Noche"--this annoying, repetitive, and saccharine tune should be buried instantly. Sadly, reports are that nothing on the disc is any more worthy of airplay. It could leave some radio listeners in the unenviable position of actually praying for the November release of the new Backstreet Boys CD! Elsewhere, true Latin breakthrough artist Ricky Martin pushed his new single "She Bangs" with an Internet exclusive. In conjunction with America Online (AOL), Martin previewed the lead-off single from his upcoming set online, which jump-started the track at radio. Last week "She Bangs" made an impressive entrance in the Top 40 of "Billboard's Hot 100" and garnered "Hot Shot Debut" honors. While not necessarily a "bad" cut, it strikes the listener as instantly familiar--and with good reason. Here Martin seems all-too-comfortable revisiting his breakthrough #1 "Livin' La Vida Loca." While most artists opt for growth, Martin and crew hedge their bets on the first single from his forthcoming disc. The Latin sensation is likely to rocket up the charts, but is apt to disappear just as quickly. "Vida Loca"-lite can only take him so far. Meanwhile, The Spice Girls are readying their full-length set (titled "Forever") to show the world that there is life after Ginger. With "Holler," the group that arguably started the whole teen movement with their 1997 #1 smash "Wannabe" is back. Employing Producer-of-the-Moment Rodney Jerkins--who has crafted smashes for Destiny's Child, Toni Braxton and Mya in recent months--"Holler" shows a more urban influence than previous Spice Girl outings. Each girl has foregone a solo career to take turns on this watered-down hip-hop number from across the Pond. Any of the Girls' recent solo efforts, most notably Melanie C's house-influenced "I Turn to You," have been better than this. If the disc is going to prove its point, the supporting tracks had better be stronger than what we've been given thus far. For true British R&B with outstanding Jerkins-influenced production, skip The Spice Girls and pick up Shola Ama's "Imagine." This is a track that should be firing up radios well into the winter--and Shola is hot enough to warm even the darkest, snowiest night.